Amidst the busyness of the large city of Dallas, Kessler Park is referred to as a “hidden jewel” of a neighborhood, and for very good reason. In Kessler Park, one enjoys the entertainment of Dallas at their fingertips, as Downtown Dallas is only 10 minutes away, without the sacrifice of old-Dallas charm or a quiet neighborhood. Located just minutes from both I-30 and I-35 E, residents have easy access to the rest of the Metroplex, but the neighborhood is tucked away among well-established trees on hilly terrain. The house styles range from Tudor, to modern, to ranch, and are all beautifully maintained. The residents of Kessler Park work together on fundraisers, landscaping, and crime prevention to create a sense of community within this neighborhood. 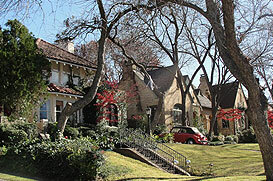 Residents also enjoy a golf course and parks within their neighborhood.